BLOG & REVIEW — CABANA CONCEPTS™ Please share your experience right here, right now. Please share your experience, pictures, and comments with us below! Cabana Concepts has been working hard behind the scenes! Check us out as we perform our laser precise installation and take part in this amazing transformation! 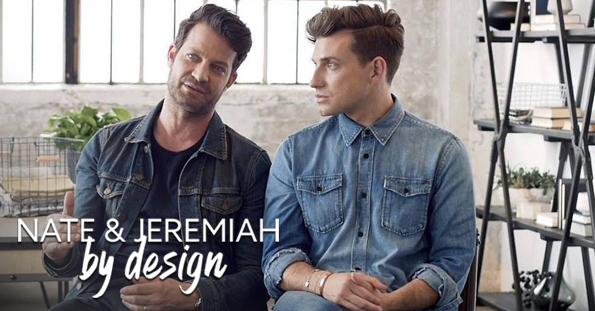 Watch the latest episode of TLC's Nate & Jeremiah By Design "Modern Beach Barn" on Saturday, April 20th at 9PM/8c. Watch how Nate Berkus & Jeremiah Brent help Lauren and George turn their dysfunctional space into a welcoming home. Just months after buying their first home, George finds out that Lauren is pregnant. With a newborn on the way, Nate and Jeremiah with the help of LaCANTINA Doors team up to turn the couple's dysfunctional space into a welcoming home for the newest family member on the way. Cabana Concepts is a top dealer and expert installer of LaCANTINA Folding Door Systems, Multi-Slide Door Systems and Swing Door Systems. Call Cabana Concepts for all of your LaCANTINA Door & Window needs! Thank you for sharing, we appreciate and value your feedback! LaCANTINA PRICES ARE INCREASING 5/1/2019! SPRING INTO OUTDOOR LIVING TODAY AND SAVE!! EFFECTIVE MAY 1ST! LaCANTINA WILL BE UPDATING THEIR PRODUCT PRICING. This manufacturer update will increase the price across all product lines by 10%. Existing quotes will be honored for 30 days. NOW IS THE TIME TO GET YOUR LaCANTINA DOOR & WINDOW SYSTEMS AND CABANA CONCEPTS IS THE BEST PLACE TO HELP YOU! Contact us today to get the best price for LaCANTINA Doors and Windows! 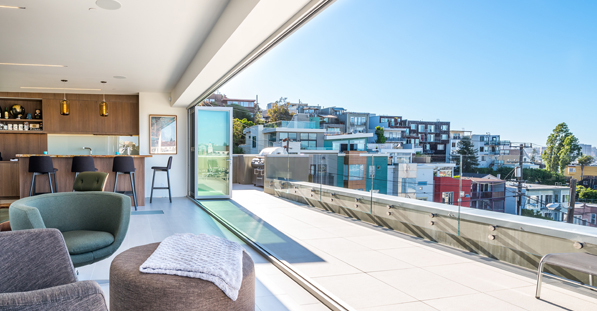 LaCantina has been recognized as a Best of Houzz 2019 winner for the seventh consecutive year. Houzz is the leading global online platform for residential remodeling and design with over 40 million monthly users. LaCantina’s work has won in the Design category, as our projects include some of the most popular images on Houzz. Our photos have been downloaded, saved, and shared on Houzz by home building, remodeling and design industry professionals that utilize this platform. A “Best of Houzz 2019” badge will appear on LaCantina’s Houzz profile as a sign of our commitment to excellence and to help homeowners identify a most popular and top-rated manufacturer. Follow LaCANTINA DOORS on Houzz. Read more about "Best of Houzz". This is another reason why Cabana Concepts chooses to deal exclusively in LaCANTINA Doors & Windows. Whether you need a Folding Door, Bi-fold Door, Sliding Door, Pocket Door, Multi-Slide or Swing Door contact us today for a free consultation and quotation for your project needs. All though we have relatively mild winters here in Southern California, there are still a few housekeeping items you want to keep up with each winter to keep your home performing optimally. Check Weather-Stripping and Trim - An easy start is to inspect all of your windows and doors from the exterior. You are looking for any visible gaps from the siding, whether it is stucco, wood, laminate and the trim. If you are able to locate any gaps fill it with caulking to help keep water out. Inspect the Shingles and Flashing - Roofing shingles can degrade over time from sun exposure. Especially on West and South facing sides of your home. If your shingles are worn out, they need to be replaced before the rainy season. You will want to check your flashing which is generally sheet metal that is wrapped around any protrusions on the roof i.e. chimney, stacks and vents. If you see any holes or any cracking around the flashing you can fill them in with roofing cement. If you have any shingles, or flashing that is damaged or missing, contact a roofing contractor. Clear Roof and Gutters of Debris - This one is as simple as it sound. You want to make sure all water is able drain easily and on it’s own, standing water can spell disaster for your roof. If you aren’t able to get up to your roof and roof drainage systems, call a professional. Check your Drainage Systems- If your home has any surface, or subsurface drainage systems, be sure to visually inspect what you can to insure there aren’t any blockages. Walk the perimeter of your property during a heavy rain to look for any signs of over flooding or areas of concern. Make Sure Your Furnace is Ready for Cold Weather - To test your furnace turn the heat up to 80 degrees on your thermostat. As long as the furnace turns on and it is blowing warm air all is good. Inspect the furnace for any signs of damage and make sure your replace your air filter at the start of each winter. If there are any obstructions to the vents or ducting in your attic or crawlspace remove them and check for leaks in these areas while the furnace is running. It’s always wise to consider hiring professional evaluate and service your furnace. A professional can find issues you don’t even know to look for and they will keep your furnace running most efficiently. 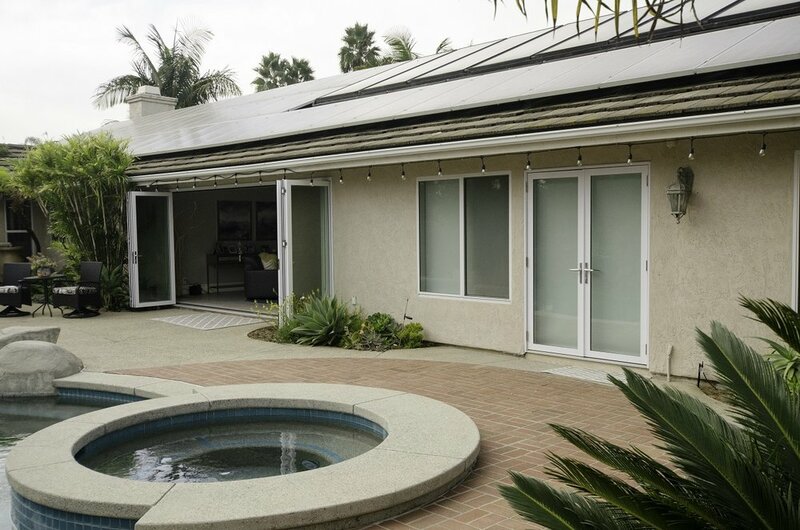 CABANA CONCEPTS: Goes the extra distance when weatherproofing your LaCANTINA Door & Window Systems. At Cabana we use the highest quality hybrid sealants and flashing materials that we have personally tested in extended exposure to the elements. 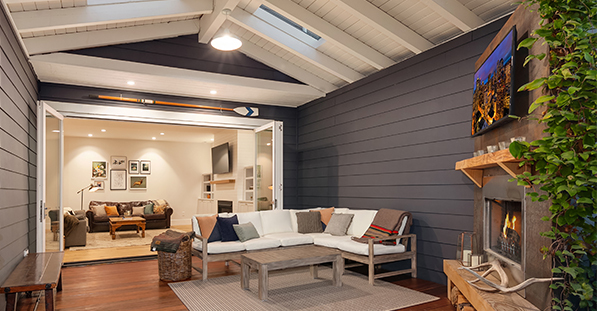 From sill pans under the threshold, to flashing, foam and caulking Cabana Concepts insures that your LaCANTINA Doors & Windows stand up to any weather Southern California can throw at it. Call us today to learn more! For the second consecutive year, LaCANTINA was 2018 Brand Survey Winner in the Bifold Doors Category by Builder and Developer, a leading trade publication focused on the production home building market. LACANTINA was Selected by a survey of Builder and Developer readers, who voted for their most preferred brands in product categories including flooring, roofing, appliances, kitchen & bath, doors & windows, smart home technology and more. 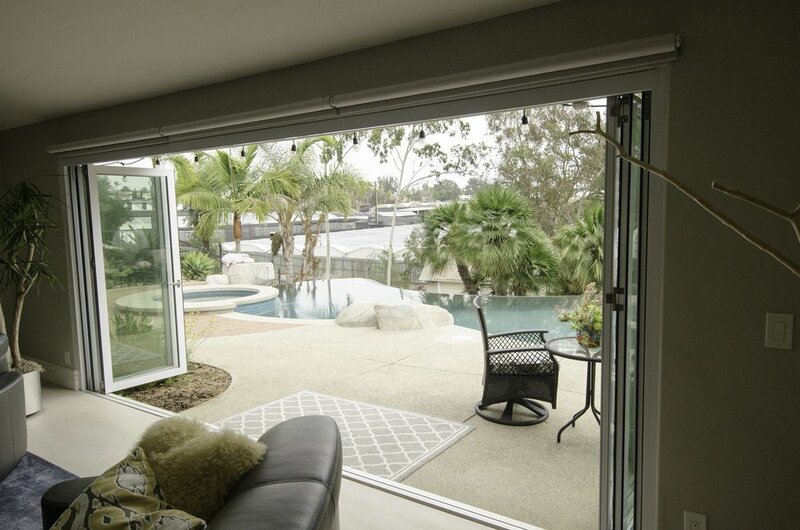 LaCANTINA' s innovative Folding Door Systems were the voters’ top choice. As a pioneer and leader in the design and manufacturing of folding door systems, LaCANTINA also offers Multi-Slide and Swing Door Options and is committed to leading the industry in development of new and innovative products. Cabana Concepts is a preferred dealership of LaCANTINA Doors. Our product line, installation and servicing is exclusive to the LaCANTINA brand and this specialized knowledge makes us your local LaCANTINA experts! This is our new Logo! T-shirts, hats and cabana decor coming soon.